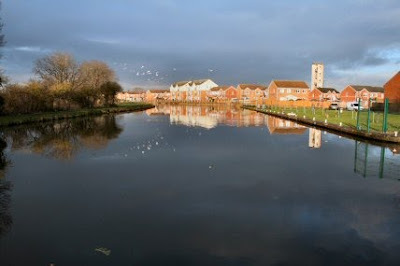 I know it looks as though I am in the middle of the canal but that is where the bows are. I backed into the facilities. On Sunday morning the ice was, I thought, thin enough to get out and in addition a boat had come down the canal and moored not far from me in the marina. After trying to get out astern and finding it iced up in the middle of the marina I went back to the start and turned around to make like an ice-breaker - but gently - as I didn't want to do damage to other boats with the two inches of ice. The ice started to break up but in the end I left the engine running slow ahead and went on to the bows and broke the ice with a boathook otherwise I would still be there. The marina dwellers were the usual helpful lot with assistance in turning - it was a bit tight and others ice-breaking from the ends of their boats to aid my passage. Coming to the entrance, or exit in this case, of the marina I found a fishing competition in full swing and because of the melt water bit of a high flow down the canal. 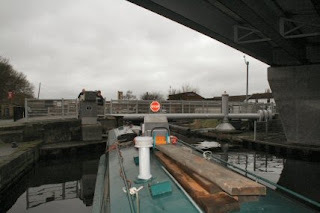 The problem now was getting around the turn for when my bows were well into the canal my stern was still inside the marina and the water was taking me down stream. No way could I turn and one angler got right shirty with me so I cast doubt on his parentage and his intellectual ability as I went sideways down the canal past him. One angler, somewhat more intelligent than the other shoved my bows away from the bank so that I could bring the stern in. I reiterated my thoughts to the angler as I went past a second time. I don't think he was impressed but he did learnt a few new concepts. 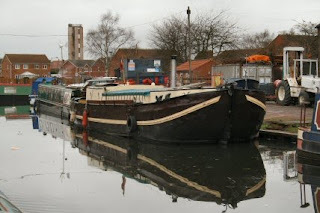 Tim has been stuck at Thorne Boat Services for the last month. He went to open the swing bridge for me. At first, yet again, it didn't want to play but a jiggle with the key and the flashing light came on and it opened. Gangoozlers fell in behind him to check out the problem. Just the other side of the bridge is a 1904 Dutch Barge. I will have to take a look into some history here.